Specifications︰ 6-Stand (6x19, 6x31, 6x41 families): These encompass the wire rope used to make slings as well as the most common crane cables. 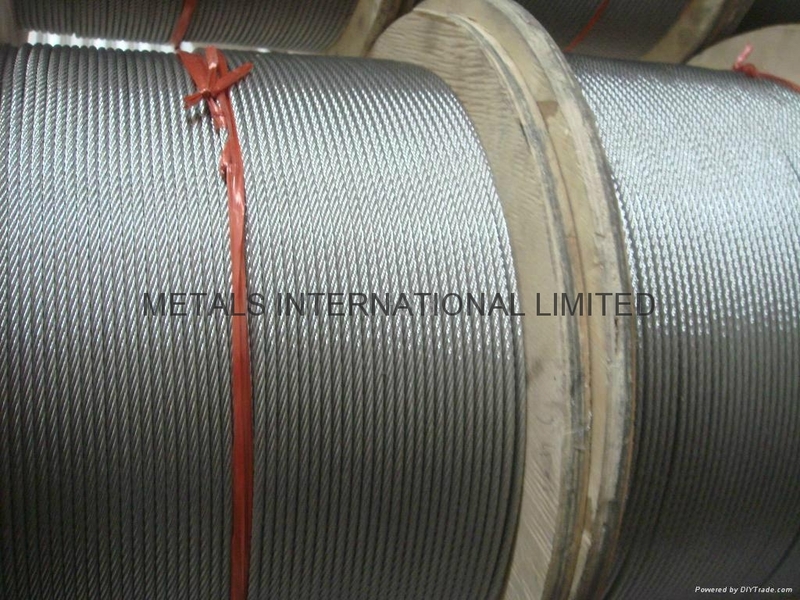 • 7-Strand (7x7, 7x19): These constructions are predominantly galvanized or stainless aircraft cable. We carry them in both commercial grade and federal/military specification grade. • Coated cable (Clear PVC, Colored PVC, Nylon Jacket). Normally 7-Strand Construction but we also have plastic coated “wire rope”. • Rotation Resistant Wire Rope (19x7, 19x9, 8x19): Mid-grade performance rope designed with resisting rope-spin in mind. 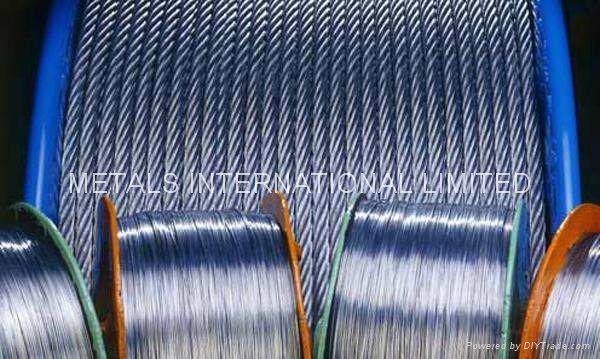 • Special/Atypical Constructions including: Lang-Lay, Alternate-Lay, Left-Hand Lay, Fiber-core (as opposed to Steel Core or Independent Wire Rope Core (IWRC)), Die-Drawn, Pre-Stressed, Plastic Impregnated, and Specialty Foreign Constructions (and metric sized ropes etc). Most wire rope is made from several strands of wire that are tightly wound together around a larger core. In many heavy-duty industrial operations, wire rope is relied on every day to help with heavy lifting and support applications. From mining to forestry to marine and beyond, there’s wire rope for almost every job. 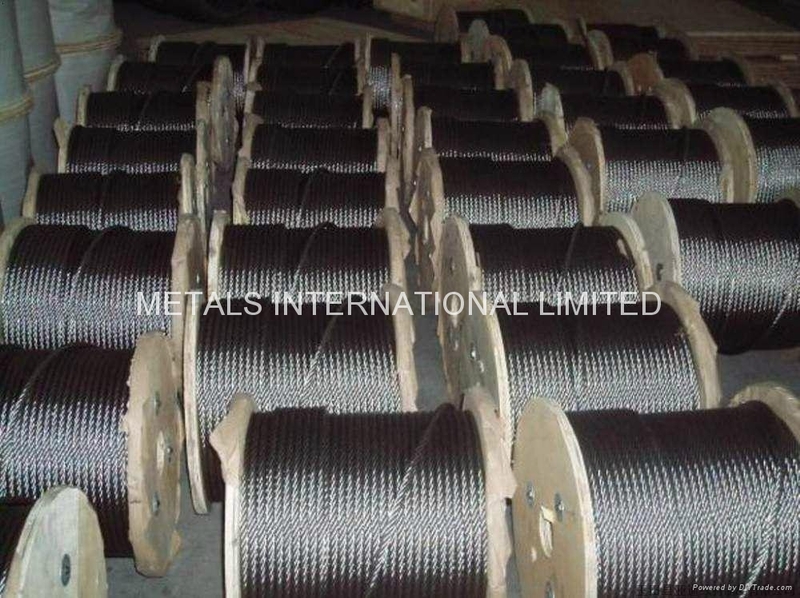 Most wire ropes are manufactured from strands of cold drawn carbon steel wire, although stainless steel is sometimes used because of its anti-corrosive properties. These wire ropes are also referred to as stranded wire. For added strength and durability like what is needed in aircraft cables, galvanized cables are a very popular choice. Sometimes cable is specially treated and coated with plastic or some other compound for added protection. This is particularly important to prevent fraying if the wire rope is often in motion on a pulley. Manufacturers and distributors identify the differences in wire cable by listing the number of strands and the amount of wires per strand so that anyone that orders understands the strength of the cable. Sometimes they are also categorized by their length or pitch. 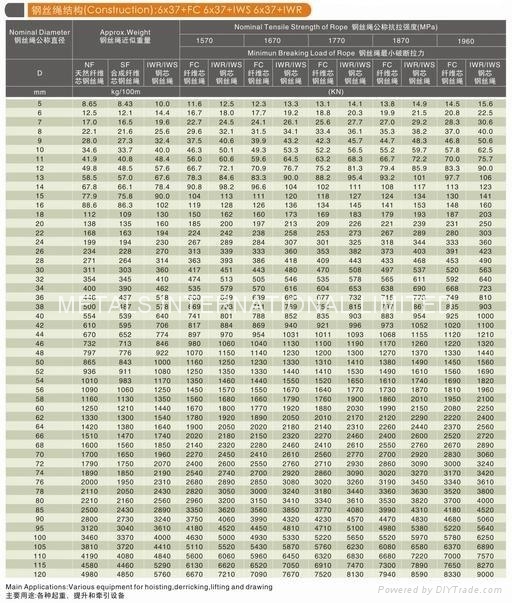 More complex wire rope identification codes connote information like core type, weight limit and more. Any additional hardware like connectors, fasteners, pulleys and fittings are usually listed in the same area to show varying strengths and degrees of fray prevention. 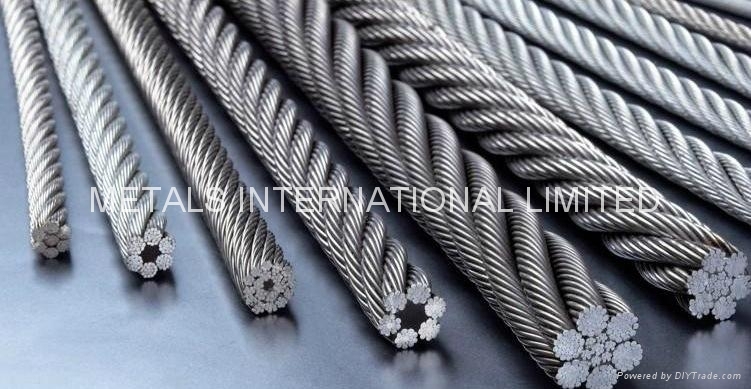 Steel is the most common material for wire rope, although many manufacturers also produce aluminum, nickel, copper, titanium, and even bronze rope for some applications. Strands are made by tightly twisting or braiding individual wire together. One strand could have anywhere between two and several dozen wire filaments depending on the necessary strength, flexibility, and weight capacity. One of the most dynamic elements of wire cables is the inner core. The strands are wrapped around the core, and it can be made of different metals, fibers, or even impregnated fiber materials. For heavy applications, cores are often made of a different strand of wire called an independent wire rope core (IWRC). An IWRC has a considerable amount of flexibility and it is still very strong. 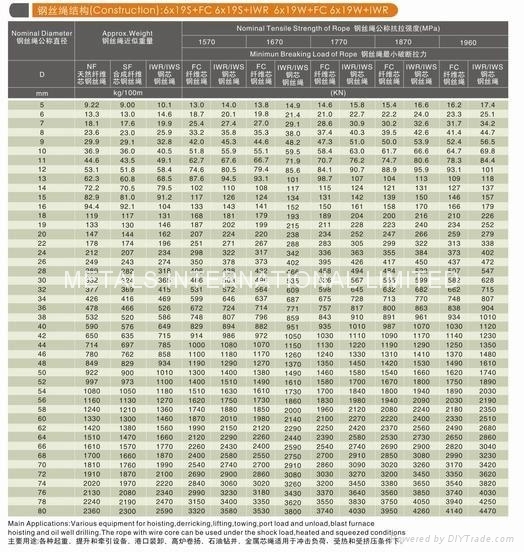 In fact, at least 7.5% of the strength increase in a wire rope can be attributed to an IWRC. The design of wire rope makes it possible for extremely heavy loads to be lifted because of the even distribution of weight among strands. Quality cables are an important safety feature in many industrial applications, so they should be regularly inspected for wear and degradation. 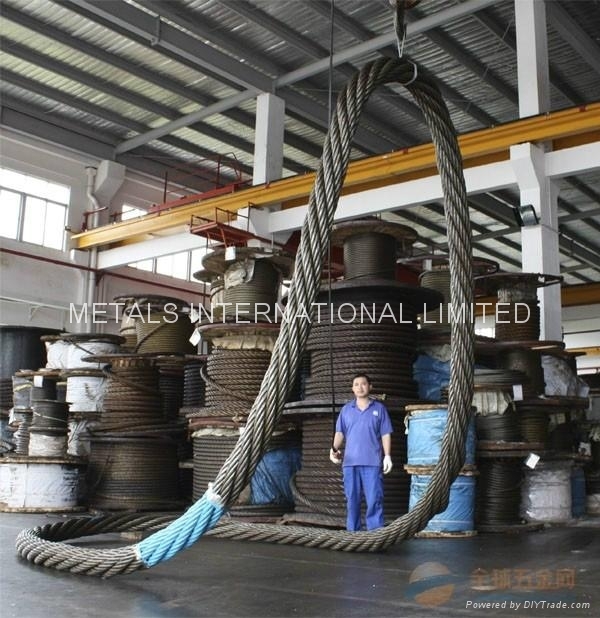 The right wire rope should be selected for a particular use. Attributes like diameter, resistance to rust, breaking strength, flexibility and lifespan should all be carefully considered. An important point to consider is the selection of the proper type of core needed in the rope. Wire Ropes are made with either fiber core or steel wire core. This center is made of either natural fibers or polypropylene and offers greater elasticity than the independent Wire Rope Core. This center is usually composed of a separate 7x7 wire rope designated as IWRC. The steel core increases the strength by 7% and the weight by 10%. These steel cores provide more substantial support than fiber cores to the outer strands during the rope's operating life. 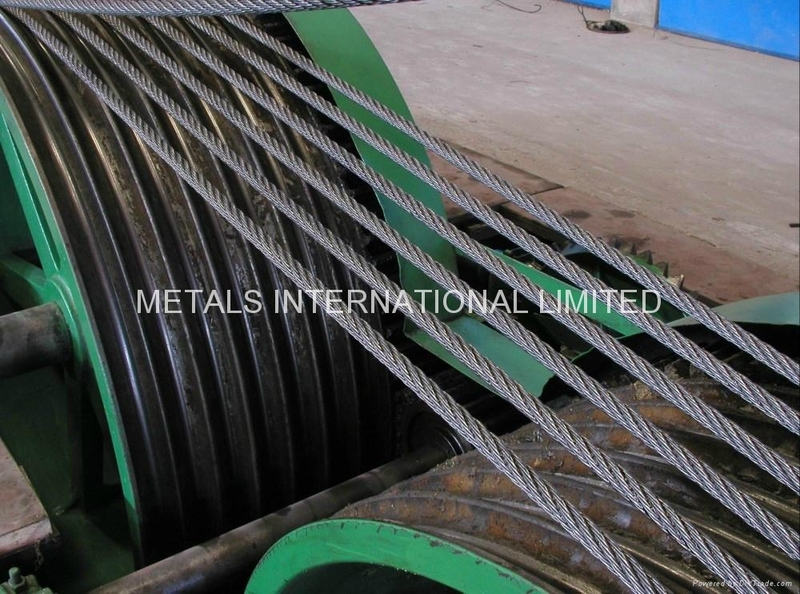 Steel centers resist crushing, are more resistant to heat and increase the strength of the rope. 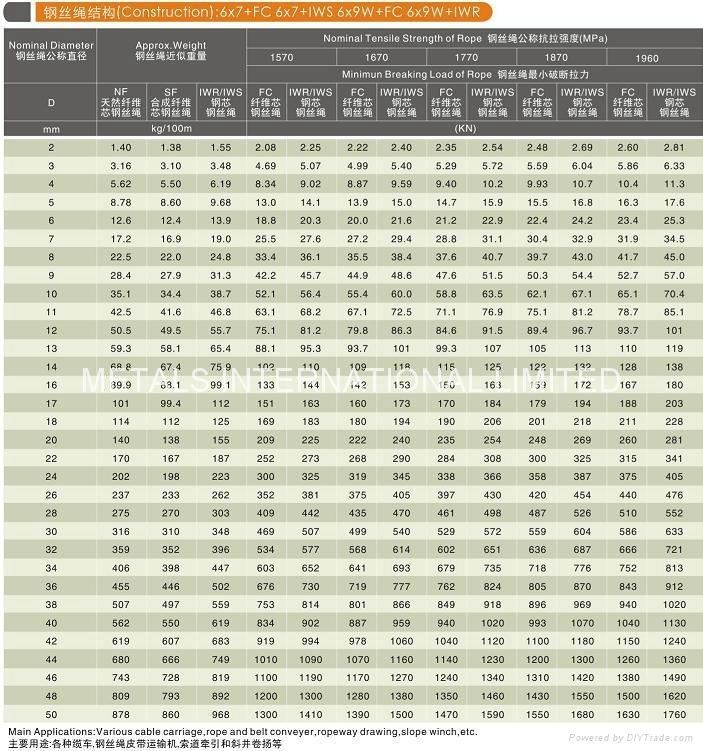 The Design Factor being both the ratio between the minimum Breaking load of the rope and the rated capacity (RC) tells at what percentage of its ultimate strength a wire rope is operating. The Design Factor takes into consideration both normal rope wear and potential stresses in various applications. The best practice in determining an adequate design factor is to analyze the specific conditions involved inn each individual installation. The following example shows how to determine the Design Factor: If a rope is working under a max. operating load of 10,000 lbs. and is having an ultimate strength of 50,000 lbs., the factor is 5 which means it is operating at 20% of its ultimate strength. The fleet angle is the angle formed between the rope running to or from the extreme left or right of the drum and a line drawn from the center of the sheave normal to the axis of the drum. For optimum efficiency, the angle here should not exceed 1 1/2 degrees for a smooth drum, or 2 degrees for a grooved drum. If the fleet angle is larger than the recommended limits, it can cause bad winding on smooth drums and rubbing against the flanges of the grooves. Too small a fleet angle should also be avoided since it will cause the rope to pile up against the flange head. Before installing any wire rope that winds onto a drum, the fleet angle should be checked and if found improper, conditions should be corrected. Proper alignment of sheaves is essential. The main sheave should line up with the center of the hoisting drum, otherwise both the rope and sheave flanges will be subjected to severe and rapid deterioration will occur. If rope speeds are high, sheaves should also be balanced.